This is making it very hard to troubleshoot. For example if I redirect /this to /that, then change my code to NOT redirect /this anymore. Google Chrome is still redirecting to /that. Like the redirect is cached or something. Is there a way to turn this off? Google Chrome will cache your 301 redirects. To get around this, and to keep the tabs open, you'll just need to clear your browser cache. Whatever else you select, make sure "Cached images and files" is a checked option. Then click Clear browsing data and you should be able to retest again. If you've just followed the redirect, you only need to delete data from the past hour. Alternatively, test and develop in incognito mode. There the cache is flushed after the browser is closed. Here's an excellent explanation of how these 3 options differ. It's not a perfect solution, but I was able to prevent Chrome from using the cached redirect by passing a bogus query string, or adding a bogus parameter to the existing query string. For example, adding a simple ? to the end of a URL that didn't have q query string worked for me on Chrome 30 on Max OS X. If the resource in question is a subresource, reloading the page will cause the redirect to be re-validated with the server. You don't have to lose your entire cache. Just follow the redirect and delete the last hour. If you have the "Disable cache (while DevTools is open)" option enabled in the DevTools, then simply having the DevTools open is enough to bypass the redirect cache, without constantly throwing away your session. Chrome caches HTTP redirects and stop checking with the site if the redirect has changed. This can be frustating, since the easiest way to fix (visiting the site and forcing a hard refresh) can't be used because the redirect will happen before you access the link. This is a won't fix issue. 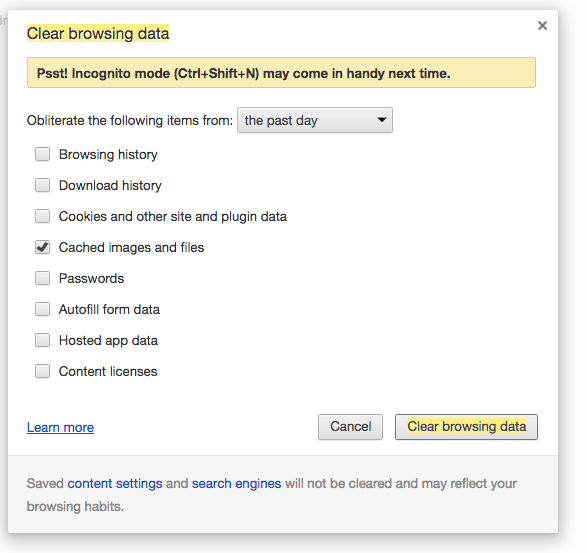 Go to chrome://net-internals and at the far right open the drop-down and choose "Clear Cache". As of version 48, this was the only thing that worked for me to clear a cached 301 (permanent redirect). Update: Unfortunately, as of version 71 (Dec 2018) Google has removed the net-internals feature. To clear the redirect cache for a single page in Chrome, View Source and do a hard refresh (CTRL + SHIFT + R). This works as the source browser doesn't automatically follow the 301 redirects. Since Chrome 63, out December 2017, all domains ending on .dev (and .foo) are forced to use HTTPS via a preloaded HTTP Strict Transport Security (HSTS) header. If you just want to check the redirects are working as expected it's probably easier to use a command line tool like wget or similar. You can inspect the response headers and redirects are not cached. In either Chrome or Firefox, you can refresh the redirect by typing "view-source:redirect.yoursite.com" and hitting enter. Then, refresh that page. Now, that should force Chrome or Firefox to refresh the redirect. For develop purpose i recommend you in Chrome open DevTools settings and check "Disable cache". Then 30x redirects are not cached and you can debug .htaccess files and so on! simplest method, hard refresh. hold Ctrl + R a few seconds. This clears redirects as well as static resources. I tried all answers on this page but none worked until I ran flushdns on windows command line window. FYI, I already had Disable cache checked as mentioned in this answer. If you don't want to lose your entire cache and your redirect is still stuck in cache, you could try visiting the view-source: version of the url. That refreshed the redirect cache of the same url for me. Not the answer you're looking for? Browse other questions tagged google-chrome web-development redirection or ask your own question. Why is Chrome ignoring /etc/hosts on OS X? 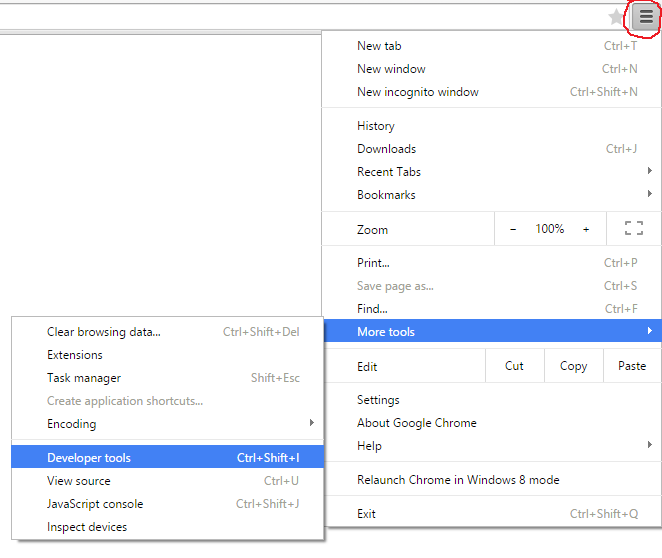 How to make Chrome remember page size? Is there any way I can force Firefox to NOT cache redirects (301 and 302)? How do I force Chrome to load a fresh copy of a page?